It has been wet and rainy all week- which means a lot of playing inside (read: two stir crazy little boys). As we were coming downstairs this morning, RJ started excitedly screaming, “Mommy!! Mommy! Can we keep it?! !” As my heart dropped (because God only knows what that child was talking about- and my thoughts went flying directly into how am I going to get rid of the racoon, mouse, squirrel, etc that invaded our home..), I was thrilled to find the cutest baby lizard in our entryway. We played with this little guy for hours. 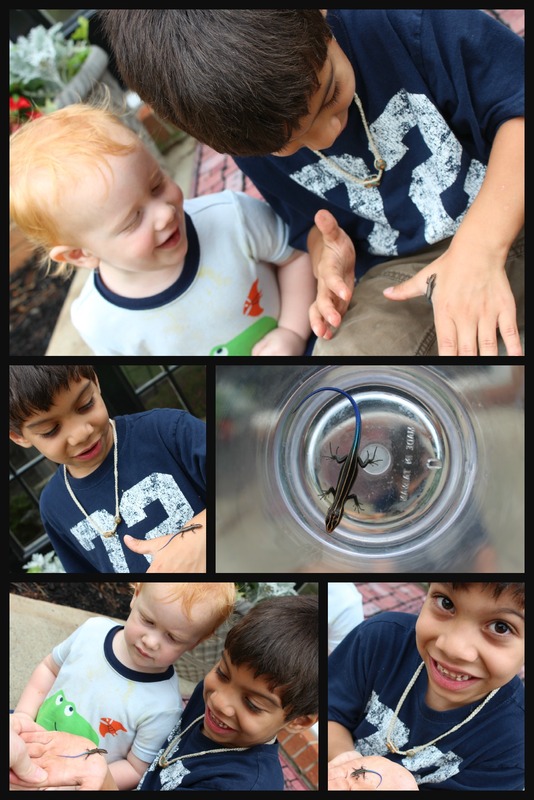 What is it about little boys and lizards?! How fun! This entry was posted in A diary for baby and tagged little boys, lizards by themielkeway. Bookmark the permalink.